I have said it before, but I learn so much from talking to all of the artists involved with the My Louisiana Muse project. I spend about 25 minutes or more with each artist and am always left satisfied but wanting more! 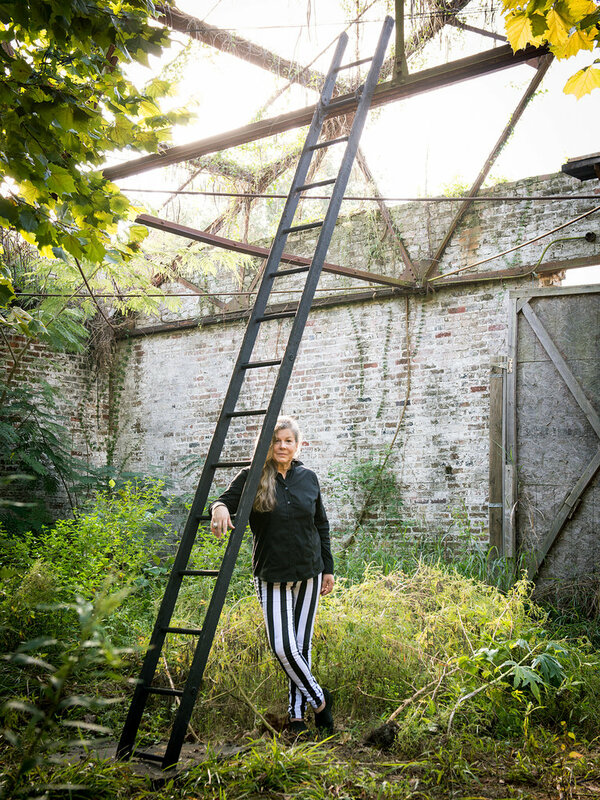 I feel one conversation is only scratching the surface with New Orleans artist Dawn Dedeaux. Looking through her website to get a feeling of her past work as it relates to her journey as an artist and where she is now, i got an overwhelming sense of panic. I did not know where to start our conversation. I remember first meeting Dawn when i lived on N. Gayoso St. near the Fairgrounds around 2003/2004. Dawn lived in the house next door and her house was like a backwoods cypress art museum. And that was just the front porch! Dawn's home and backyard were works of art themselves as she constantly surrounded herself with art and inspiration. Over the last 10 years i ran into Dawn here and there, mostly when I was more active as curator of the Canary Gallery on Julia St. Most recently I photographed Dawn and our mutual friend J. Poggi serving as wedding ministers. Through those moments Dawn has kept such a frantic pace of producing new art that it's hard to keep in touch with her, hence my panic. But our conversation was great. It was fluid and insightful, and I learned so much. Dawn's work ranges from site specific installations in nature to Julia Street galleries and museums. Dedeaux has mastered many artistic tools that are used to speak her message and is able to switch media to best deliver the idea. She loves the natural world and the assault of the natural world (it's potential peril) has been a passionate theme in her work, i.e. Katrina, BP Oil Spill. These many talents and attributes in an artist are rare and I am honored to have her in My Louisiana Muse. Louisiana and it's environs have much to do with inspiring Dawn and her work. Dawn is happy at the "edge" of Louisiana..she loves the swamp, the bayou, and the water. She grew up near City Park and hopes City Park's administration allows it to remain a natural place. (as she tells me "you can print that!"). Dedeaux feels the new trails, toy sets for kids, and dog parks are taking away from it's "gorgeous natural vistas" (paraphrased from Dawn). I have to agree with her. At what point does serenity of green space seen on the abandoned North Course inherit some sort of "do not build" clause? Her current project is an official PROSPECT 3 (P3) site that sits in a lot behind the corner of Elysian Fields and Rampart St. The current site for MotherShip II: Dreaming of a Future Past and MotherShip III: The StationInstallations, unused since the 60's, was cleared out by Dawn herself. She turned this unused space into a habitable park. You can still see her exhibit as there are many opportunities and closings on the horizon. I am so honored to have her in My Louisiana Muse.